I just love the colours here…and all that glinting gold just set my heart a flutter. So here is my take on it! 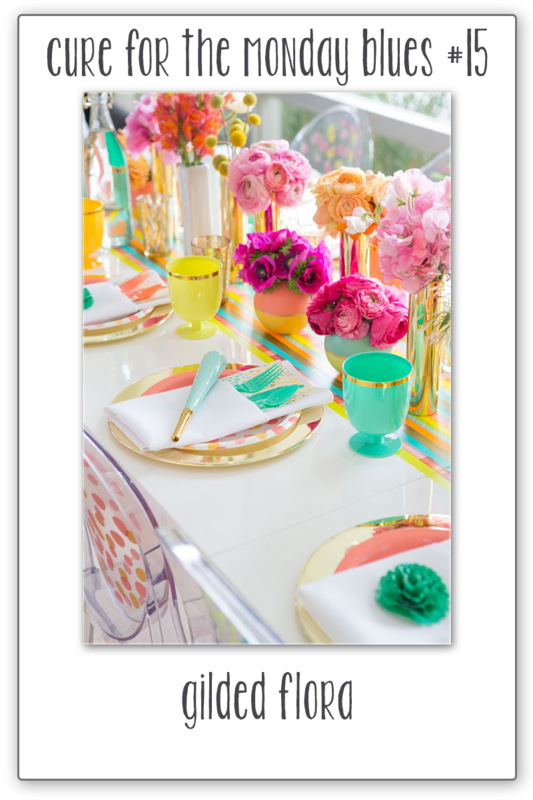 I was inspired by the blocks of colour in the cups and in the stripes going across the table….but I just wanted to see LOTS of colour, and so went for this colour-blocked look. 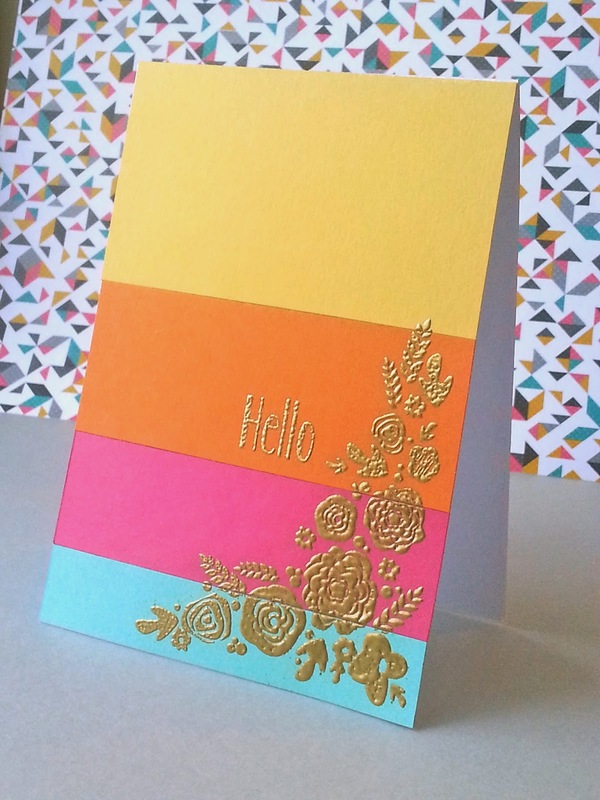 I then heat embossed the flower spray and sentiment rom PTIs Mini Blooms stamp set. The card looks super in real life! PS- I apologise for the super busy patterned paper in the BG…I was in such a hurry and the plain and simple one I chose before had so much white it threw all my colours off! So I had to change it last minute. Please try and look past it. Hhaha!! Hello all! 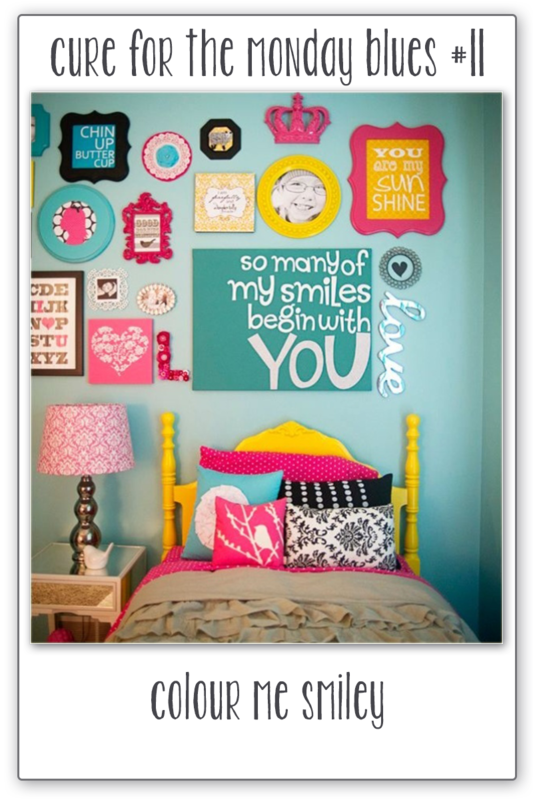 I am once again entering the wonderful Virgia's View Challenge, and this month the theme is stencils. Now, I had yet to jump on the whole stencils bandwagon, but now that I am on… I am really enjoying the ride! Here are a batch of freshly-squeezed cards I created last night while the littley was asleep (for her first leg of night sleep anyway…yes, she's two and still wakes for cuddles!!!) 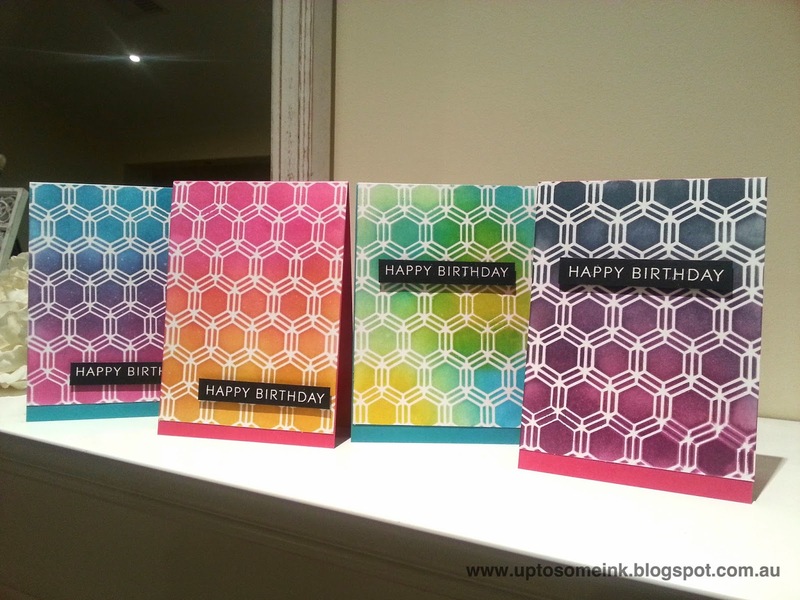 I managed to do the front panels by ink blending some distress inks over this hexagon stencil by TCW. Took about half an hour. 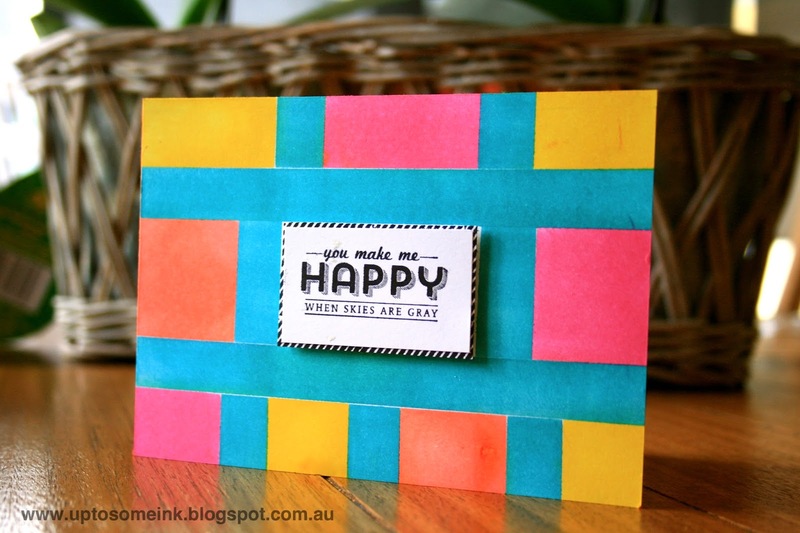 *Cue: baby whining> resettle> sneaky exit from nursery> wait by the door just to make sure…..mad dash back to the crafty lair to finish these cards and put them on their bases. Yes, it has been ages since my last post…but I have been busy with some study, and now that the course is over- i have some breathing space again. So, I am finally taking part in the CFMB challenge again! Okay, so this card took many journeys to get to where it is now… It's largely made by a lot of masking with washi tape and ink-blended with distress inks (I just got my first set of distress inks this weekend at a craft show- how did I not get into those babies earlier, I do NOT know..But I love them!). So my biggest inspiration from this pic was the blue wall with the colourful pink and yellow frames, and so thats the look I was going for. 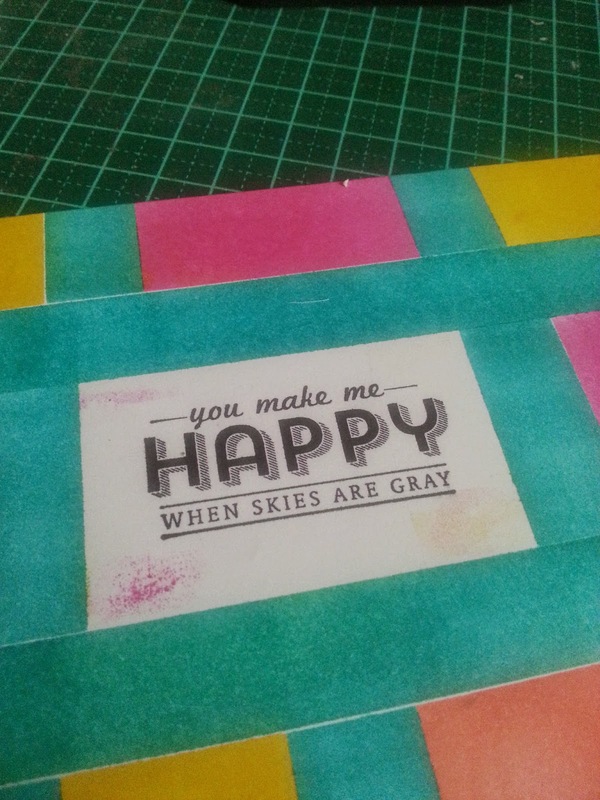 I wanted to mask off a grid with washi tape and then fill in the resulting squares with yellows and pinks, and then, I would peel off the washi and do some more masking to fill in the spaces in blue, leaving the centre section white for my sentiment. 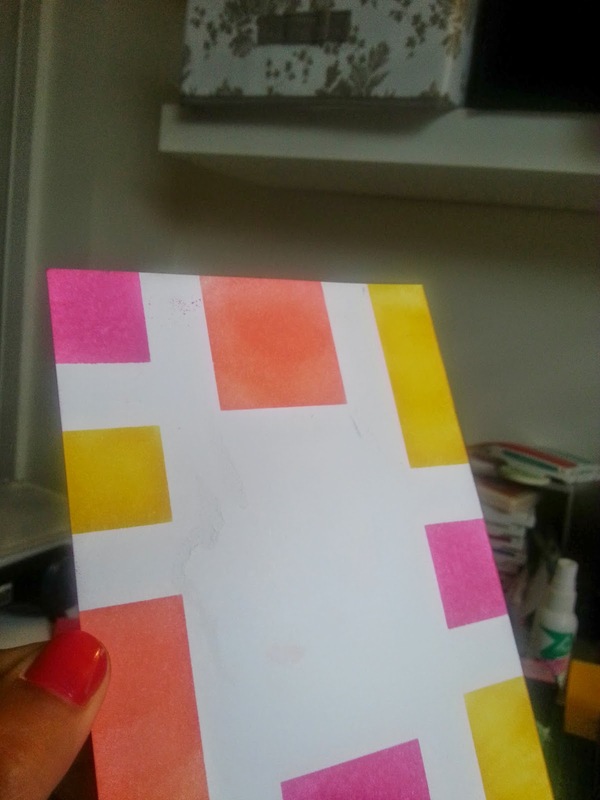 And so, second time around, I took some of the tack off the washi and tried again. Success!